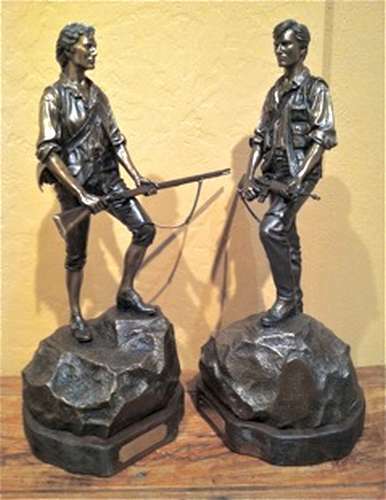 "Sons of Liberty 1775 and 1995"
Dedicated to the modern-day "Minutemen" who are keeping watch. let thy children watch and save. let thy children watch and keep." In the ancient democracies of Greece and the Republic of Rome on "Freemen" were allowed to be armed; slaves then, as now, were never allowed to carry weapons. The founding fathers of the Republic of the United States of America recognized that a government that feared an armed citizenry of free individuals was a government to be feared by that citizenry. So vital was the assurance of human liberty's continual triumph over any form of tyranny that its fate could not be allowed to rest in any but the hands of an informed and enlightened people. Thus, it is that immediately following and protective of the First Amendment guarantees of the Rights of Freedom of Religion, Speech, the Press, Assembly and to Petition Governments comes the inviolate Second Amendment Right to keep and bear arms. The original definition of "Militia" was, and still is automatically inclusive of every male citizen age sixteen to forty-five (age sixty-five for those having served in the armed forces) and now, with equality under the law this includes women citizens, as well. The original citizen's Militia were first organized by towns, then counties, then colonies, and finally by states. In the long tradition of American Independence everything had local its foundation at the local level of the individual. From the times of the Indian troubles, each local company had within it a contingent of "minutemen" who were required to be fit and ready those patriots of the political movement whose purpose it was to gain and protect Liberty at all levels within, and without, government by peaceful means wherever possible. The sum total of all these freedom-living and courageous individuals called themselves "Sons of Liberty." In addition to personal arms of every caliber, make and description, in 1775 the predominant military long arm was the "Brown Bess" musket. The first model or "Long Land adopted during the reign of King George I, had a 46 inch barrel of .75 cal. and, as depicted, was the most familiar, available and widely used firearm of the militia even after a 42 inch barrel "Short Land" model of 1740 was adopted by the British in 1765. The brown finish on the gun stocks gave them the nick-name "Brown Bess," as previous British muskets had the wood painted in black. Powder and ball were carried either separately in a powder horn and pouch or, preferably, in the military cartridge box in the form of pre-made paper or linen cartridges. By way of comparison, a modern day descendant and heir to the title of "Sons of Liberty" might typically be equipped with the now ubiquitous Colt's Model M-16/AR-15 in .223 cal. with spare cartridges carried in a cloth bandolier or in magazine pouches. In either era these noble patriots' rock-solid stand in the path of Tyranny symbolizes not a threat but a warning. As Thomas Jefferson professed: "The strongest reason for the people to retain their right to keep and bear arms is as a last resort against tyranny in government.